This product is the script which powers this website. 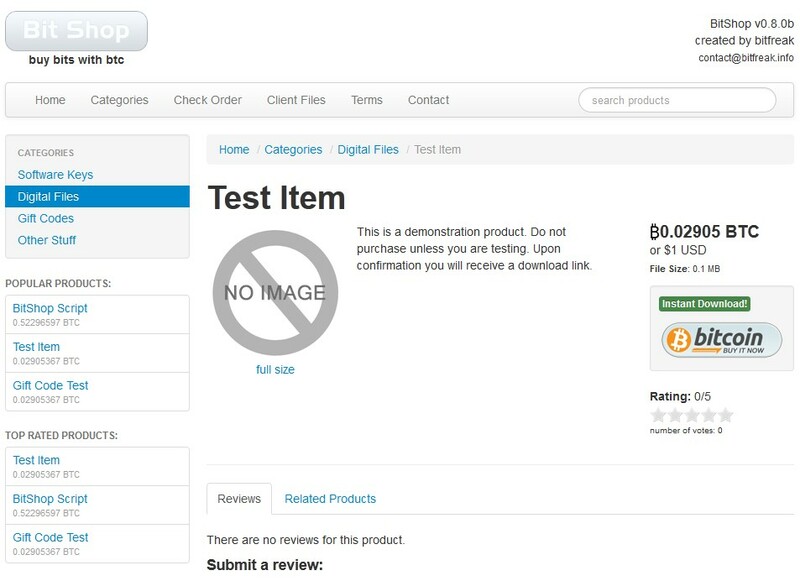 Using this script you can easily set up an online shop which will enable you to sell digital files and codes using bitcoin and other cryptocurrencies. You will receive the full source code (unencrypted). When you purchase this item you will receive a key which gives you access to 1 year of updates and support. After the key expires you may continue to use the script within the bounds of the license but you wont have access to new versions of the scripts. Works perfect and support is awesome! I would like very much if you include the possibility to send outgoing mails by SMTP! Really nice shop script, thank you. Wish it could send payment, like a wallet. Would be great if it could be installed to use with other altcoins, which are basically the same. Great script! very useful ,and well organized! Well worth the money! It's honestly scripted so clean and nice. Even a rookie like me can parse through it and customize it! VERY Happy with this.